In this stage, you can use the drawing tools to create custom hardscapes and raised areas, or take advantage of the templates available in the library. 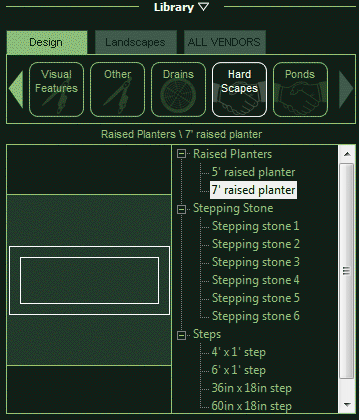 Height: This control sets the height of the selected hardscape. Hide the Height Label: By default, the height of the hardscape is displayed. This option will hide the label in the 2D view and in Construction. 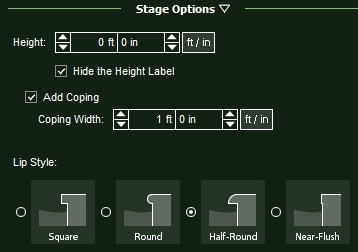 Add Coping: This checkbox allows you to add a coping edge to a selected hardscape. Coping Width: This control allows you to adjust the overall width of the coping. The limit ranges from 1″ to 18″. Lip Style: Here you can select the lip style for your coping edge. The buttons show a preview of each style. Coping options will change the way Area is calculated on hardscapes. You will notice a new value in the Object Properties of each hardscape showing not only the Hardscape area but the Coping area as well. Create Staircase: Click to insert a Staircase. Staircases will automatically attach to any shape they touch. Once placed the staircase will extend to the length of the line or arc it is attached to and stairs will be created from the top of the shape down to the next lowest platform or ground. Steps: Controls to adjust the various settings of the steps in the selected staircase. Depth: This control allows you to adjust the depth (or width) of each step. Height: This control allows you to adjust the height (or rise) of each step. Thickness: This control allows you to adjust the height of the cap/lip of each step. Step Count: This control allows you to adjust the number of individual steps in the selected staircase. Auto: Buttons found next to Height and Step Count. This control automatically adjusts the staircase to fit. For example, if Auto is selected and you change the height of each step, the step count will automatically change. Add Risers: This checkbox allows you to add risers to the staircase. Add Skirt: This checkbox allows you to add a skirt to the staircase. Flip Underground: This checkbox allows you to change the direction the staircase faces. This tool is useful when making staircases to lower areas such as sunken decks and hardscapes. Follows Contour: This checkbox allows you to follow the contour of an arc around a shape. For example when creating a spiral staircase. 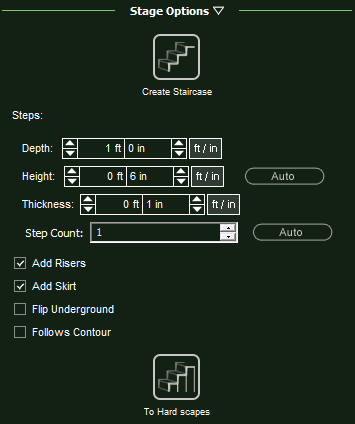 To Hardscapes: This control allows you to convert the staircase to editable shapes in the Decks Stage. The Library contains templates of previously drawn hardscape shapes. The templates are organized by Type under the Hardscapes Category. Select the hardscape template you wish to insert and either click the Insert button or double left click on the image of the template. When you move your cursor to the viewport, the template will follow until you left-click to place the item. You can also save templates you have drawn for future use with the Save button.